Not long ago, Prof. Peter Oakes’ new Galatians commentary (Paideia, Baker) arrived on my desk. I was elated because I had a chance to read Oakes’ manuscript in full last year when I was teaching an exegesis course on Galatians – it is a delight to see the final product. I am not going to do an extended review, but let me say, as someone who has read every single word of this fine volume, that it is a “must-have.” To be quite honest, sometimes when I read a commentary on Galatians, I wonder if the author knows much about the Greco-Roman world of the first century. No one would wonder that about Oakes – he is a bona fide social historian, at the cutting edge of archaeological and historical research on Christian origins. And, given the aims of the Paideia series, he does not shy away from making theological comments on the text, and they are always insightful. I am currently engaged in writing a monograph on Paul’s “faith” language, so obviously Galatians is on my radar. I think Oakes has a strong grip on how and why Paul used pistis and he navigates with finesse the challenges of the pistis Christou debate as well as what the absolute occurrences of pistis means in 3:23, 25. One more thing – as commentaries and monographs tend to be getting longer, one might get the impression that if something needs to be said, it ought to weight 10 pounds. I appreciate how restrained Oakes was, finding a way to be “weighty” without being “wordy.” Caveat auctor! This is now the first book I will recommend to seminary students who want to embark on a journey of studying Galatians and wish to have a guide along the way. 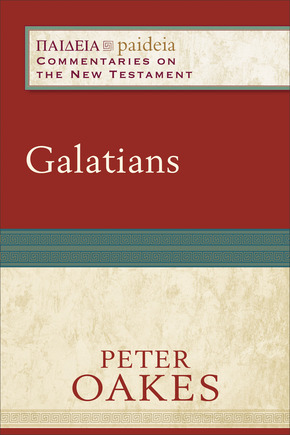 Peter Oakes is a great scholar, and I look forward to reading his commentary on Galatians. The introductory material (available on Baker’s website) is most readable, which bodes well for the rest of the commentary (I hope! ).